Suicide Squad review: Biggest. Bummer. Ever. It wasn't supposed to be this way. After a largely poor reception to Batman v Superman, David Ayer's Suicide Squad was expected to bring the DCEU back from the brink. Yet, the final product, reportedly the center of unfortunate back office politics, was nothing like the fantastic trailers we first saw last summer. The best way I can describe my feelings after leaving the theater is BUMMED. And I was one of the few who liked Batman v Superman, too. There are light spoilers ahead. Suicide Squad starts off promising enough, with plenty of energy and verve. One by one, director David Ayer (Fury, End of Watch) introduces the audience to the main cast, from Deadshot (Will Smith) to Harley Quinn (Margot Robbie). The only problem is that there just isn't enough time to actually learn, deep down, who these characters are. They aren't so much people with feelings and motivations, but more like caricatures of bad 80s villains, saying dumb things because that's what we expect them to do. Half of the squad doesn't even get a proper introduction, and neither do Rick Flag's (Joel Kinnaman) team of mindless soldiers. This is so and so and they are bad! They walk, talk, and shoot guns. That's about the extent of which we get to know who these characters are, save for Deadshot and Harley Quinn, both of whom the movie focuses on most. There are a few moments when we breathe long enough to break through each character's enthusiastically pained exteriors, revealing people who almost resemble human beings, but it isn't enough. Charming as they are, neither posses any redeeming qualities. That's the difficulty of crafting a movie around a team of such uncomplicated villains. How do you make detestable characters likable? These are criminals of the highest order who are only concerned with saving their own skin. Making the audience care for them, and not the actors who they're being played by, is a tough proposition. Making them jell with each other is equally as tough. Sadly, they barely get time to stop and interact; it's not until the end when we see them have the first meaningful conversation. 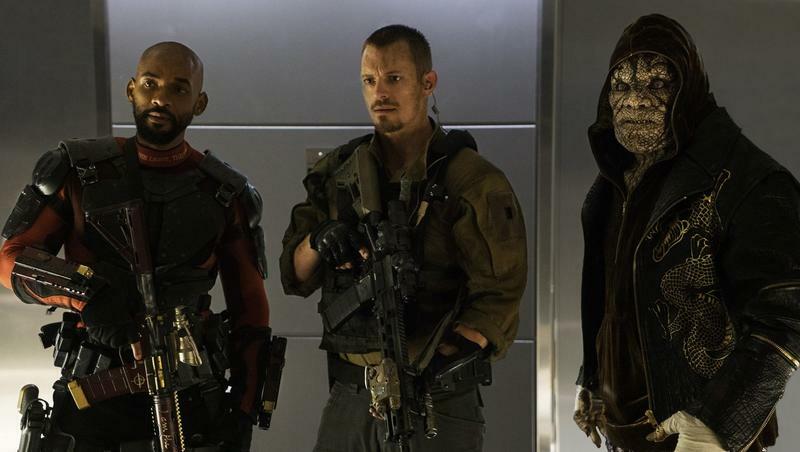 The personalities of Will Smith and Margot Robbie certainly help give Deadshot and Harley Quinn life but there's little to like about El Diablo (Jay Hernandez), Killer Croc (Adewale Akinnuoye-Agbaje), or Boomerang (Jai Courtney). Especially Boomerang, who is the biggest knucklehead of them all and was seemingly included to serve as comedic relief. Alas, he's probably the most annoying character in a movie full of annoying characters. He's even worse than Slipknot (Adam Beach), whose inclusion has no purpose. Unfortunately, the plot of the movie is just as shaky as the characters. Amanda Waller (Viola Davis), fearful someone with Superman's powers might suddenly appear and destroy Earth, puts together a motley crew of "the worst of the worst," a mix of meta-humans and meta-idiots. Why she does not seek out Batman or Wonder Woman, I do not know. But she's miserably evil and loves to make people do things against their own accord. So it goes. As soon as Waller convinces a room of high-ranking generals to sign off on Task Force X, Midway City is attacked by Enchantress; her alter ego June Moone, by the way, is in love with Rick Flag—something Waller apparently connived because of course she did. Stuff just starts happening, don't ask questions, and it's up to the Suicide Squad to stop it. If they don't cooperate they'll die. Oddly, aside from an early incident upon arriving at Midway City, they never seem in any real danger, no matter their foe. At least Superman bled in Batman v Superman. In the middle of all this chaos is the Joker (Jared Leto), who has way less screen time than you'd think. There's been so much talk about Leto taking on the role and being a weirdo on set, but all that effort doesn't seem to have amounted to much at all. He's a bit part character to the main story and only serves as an unneeded distraction. Until he doesn't. Then it's just like, oh, well, okay, that happened. As for Leto's performance, you know, I can't really decide whether I liked him or not. I think if he was given more to do and more to play with, he could have been really great. But, as it stands, his talents feel severely underutilized, resulting in a rather flat presence when he's (or isn't) on screen. Aside from seeking the love of Harley Quinn, he's obsessed with the image of "underground drug lord," highlighted by his dangerously absurd room of knives, electronics and baby clothes. This doesn't seem like the same guy who beat Robin to death. Ultimately, Suicide Squad doesn't reach the lofty expectations set by the footage fans first saw at Comic-Con last year. There are glimmers of hope, certainly, and a handful of scenes that convince us these characters are on screen for a reason. But it's all such an empty mess. Enchantress simply didn't make a good villain and most of the squad reminded me of high school mascots gone bad. I wanted to love this movie but, in the end, it's entirely forgettable. It says a lot when the best part is a Flash cameo that lasts all of three seconds.